Ukrainian Prime Minister Arseniy Yatsenyuk. Ukraine has opened legal proceedings over the construction of the Nord Stream 2 gas pipeline from Russia to Germany, which will obviate the need to ship gas through Ukraine to the EU if it is built. 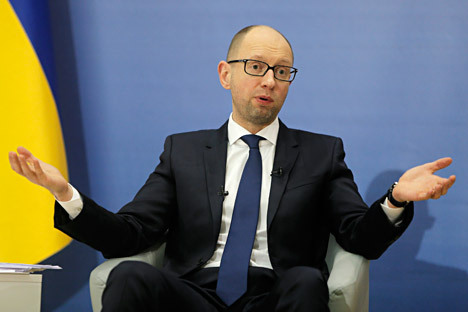 Prime Minister of Ukraine Arseniy Yatsenyuk has said that Ukraine has filed a lawsuit in connection with the construction of the Nord Stream 2 gas pipeline and is asking the European Commission to launch an investigation into what he describes as an "anti-Ukrainian project." "I would like to announce that Ukraine has filed a lawsuit in the case of construction of Nord Stream 2. It is a political project. We ask the European Commission to launch an investigation and stop the anti-European and anti-Ukrainian project," said Yatsenyuk during his meeting with Slovak Minister of Foreign Affairs and Deputy Prime Minister Miroslav Lajčák on Feb. 1. According to Yatsenyuk, Ukraine insists on the canceling of the project, which foresees the construction of an undersea pipeline from Russia to Germany via the Baltic Sea, circumventing transit countries such as Ukraine, with which Russia has had a number of gas disputes resulting in disruptions to supply from Russia to the EU. "We do not want to let the Russians outmaneuver us, we want to build a transparent European gas market, that’s why we are sending out a strong signal to our European partners and the European Community. This project should not only be reviewed, but canceled,” he said. Earlier it was reported that Germany will approve the construction of Nord Stream 2 only if it guarantees gas supplies to Eastern Europe. Ukrainian President Petro Poroshenko said that Kiev considers Nord Stream 2 a serious threat to its energy security. Polish President Andrzej Duda has said that the project threatens the "energy security" in Europe and aims to close the traditional transit of gas through Ukraine. It is not clear at the moment how strongly the loss of transit fees will affect Poland but Ukraine will lose at least $2 billion if Nord Stream 2 goes ahead. On Sept. 4, Gazprom signed a shareholder agreement on construction of the Nord Stream 2 gas pipeline, which provides for an increase in the supply of natural gas to the EU. On Dec. 21, Minister of Economic Development of Russia Alexei Ulyukayev said that the rejection of Nord Stream 2 by the European Union would be a "shot in the foot," because the project is aimed primarily at Europe's energy security.